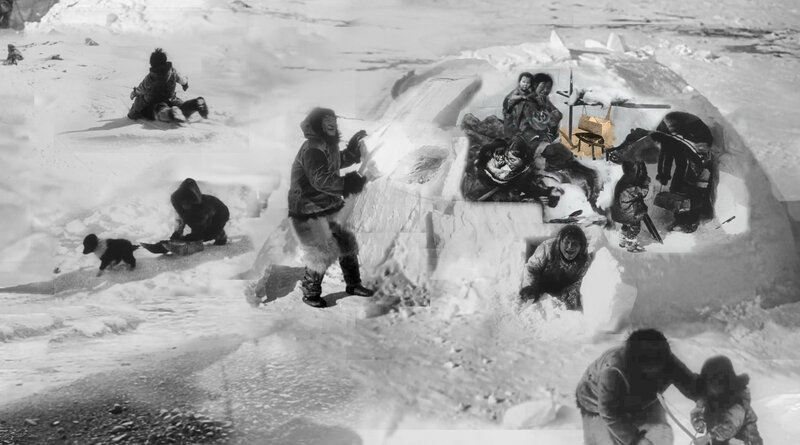 Nanook of the North Redux is a narrative composition assembled from over 200 manipulated stills from Robert Flaherty's 1922 pioneering feature documentary1. 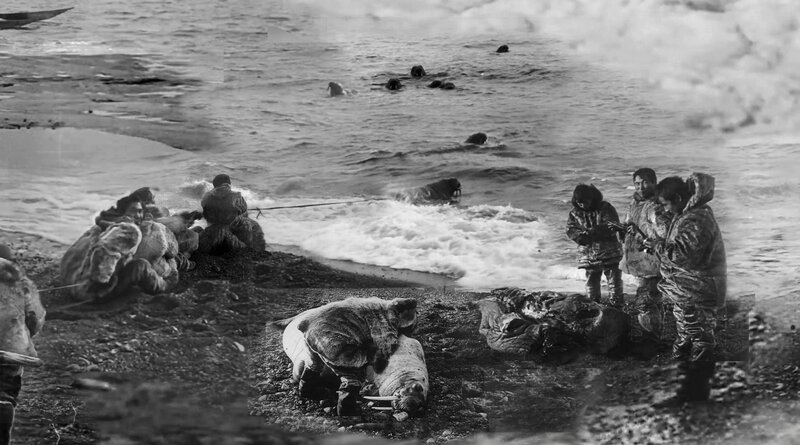 The work recontextualizes Flaherty's romanticized portrayal of Inuit culture living on the Ungava Peninsula of Northern Quebec, Canada. The docudrama is both fiction and ethnography, with Flaherty staging events for the film and casting the renowned hunter of the Itivimuit tribe, Allakariallak, in the lead role of Nanook (Nanuq ᓇᓄᒃ, Polar Bear). Nanook's two wives, Nyla and Cunayo, were played by Alice Nevalinga and an unknown Inuk woman. The story offscreen, however, was less innocent, with both female actors having become the common-law wives of Flaherty2. Shortly after his departure in 1921, Alice Nevalinga give birth to a son, Josephie, whom Flaherty never publicly acknowledged nor supported. Many of the Inuit living in Ungava including his son, were part of a forced migration by the Canadian Government in 1950 to the High Artic. 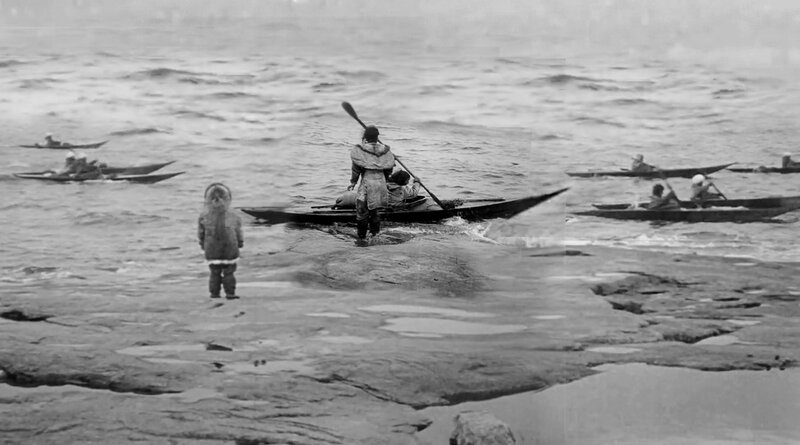 Allakariallak, made famous by the international success of the film, died two years after its release. Flaherty cited starvation as cause of death, but Allakariallak most likely died from tuberculosis3, introduced through contact with foreigners. 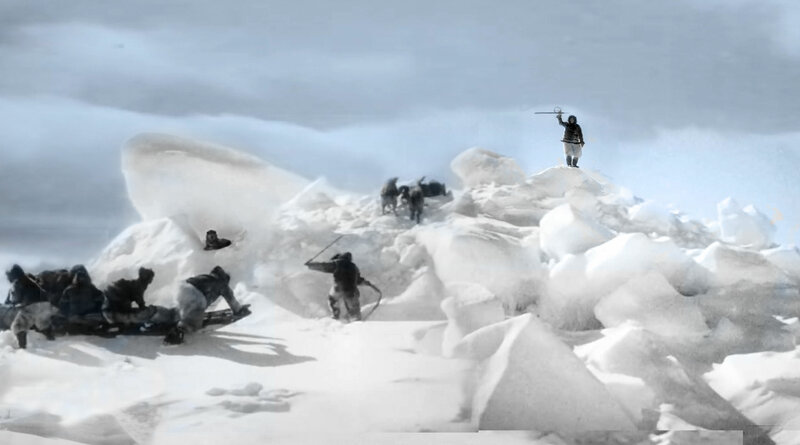 Despite Flaherty's desire to depict the traditional, pre-European life of the “Eskimos” (the Inuit had already adopted guns and other Western goods via the fur trade), the life of the Inuit, their joyful mastery of survival in the harsh Tundra, were real and miraculous to the outside world. This work follows the seasonal cycles of the Inuit's traditional nomadic life, offering a record of a people untouched by the modern industrialized era, living solely from the meat of the hunt in a world too frozen for trees. While the greater arc of climate change concerns the future, it is only through a measure of the past that we can gain a perspective on the scope of the loss of the natural world, cultural knowledge acquired over millennia, animals that have timelessly evolved to the rhythms of their vast environment and ultimately to the loss of a habitable planet. In this we are all Nanook. 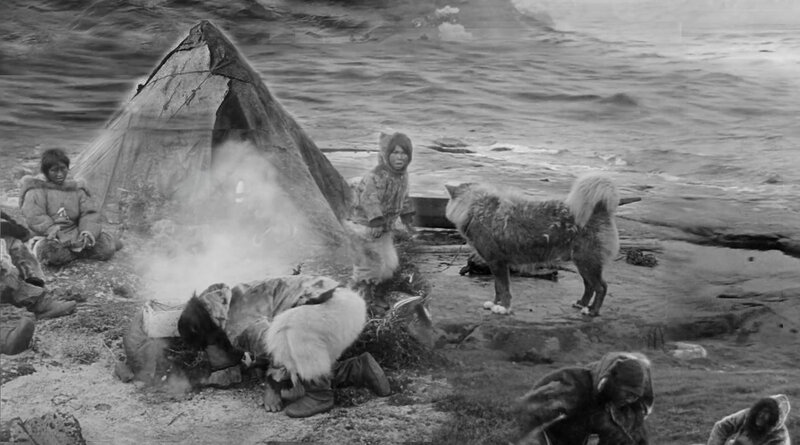 1Nanook of the North also known as Nanook of the North: A Story Of Life and Love In the Actual Arctic) is a 1922 American silent feature-length documentary film by Robert J. Flaherty shot on a Bell & Howell camera using a local crew of Inuit. Rushes were laboriously processed locally and screenings were received enthusiastically. 2 Julia Emberley. Defamiliarizing the aboriginal: cultural practices and decolonization in Canada. 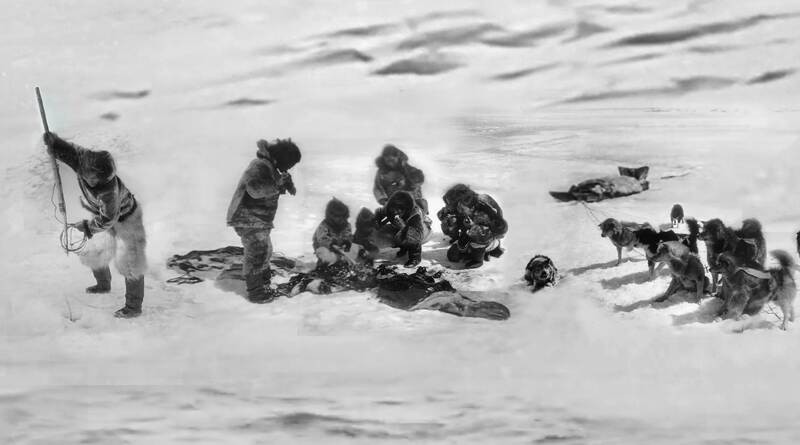 p. 86 (citing Fatimah Tobing Rony, Taxidermy and Romantic Ethnography: Robert Flaherty's Nanook of the North). 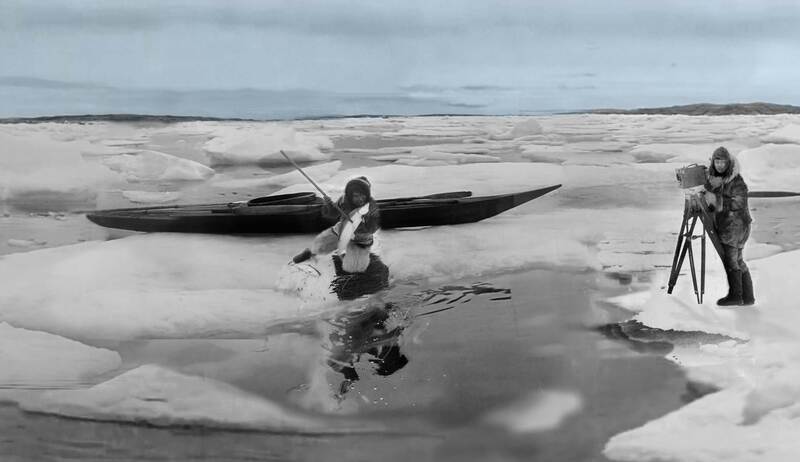 Detail: ice fishing with Robert Flaherty filming. Detail: Nanook signals from atop a small mountain of ice fields. 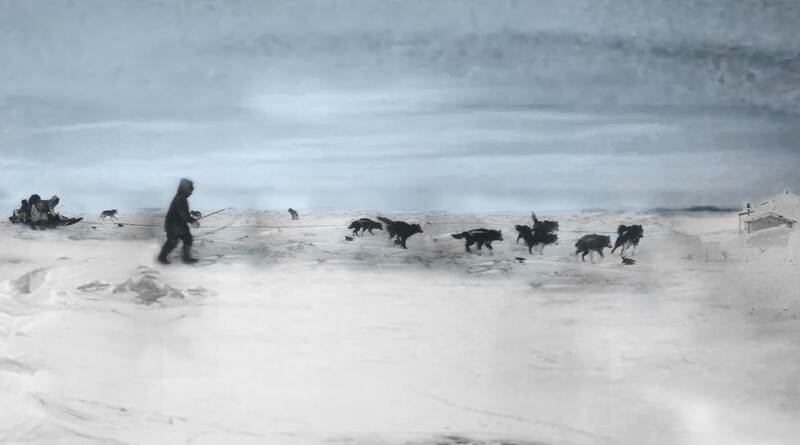 Detail: Nanook and family set off on sled led by a team of dogs. Detail: A tupiq ᑐᐱᖅ (traditional hide tent) summer camp on the shore of Hudson Bay. Detail: Igloo (iglu ᐃᒡᓗ), interior and exterior . 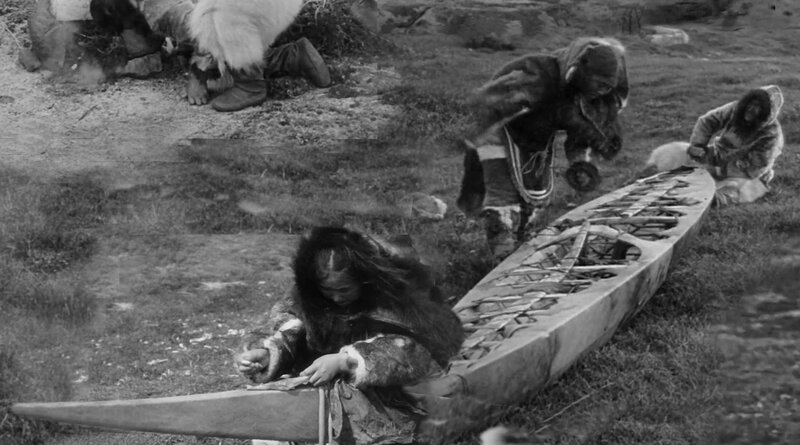 Detail: skinning a kayak, qajaq ᖃᔭᖅ. Detail: Walrus (aaveq ᐁᕕᖃ) hunt. Detail: Kayaks set off for the walrus hunt.